When you make a good dressing such as the Thousand Island [recipe here] from the other day it’s only natural that you want to use it in a million other recipes. Well. Maybe not a million. How about six? Here’s the first of six. 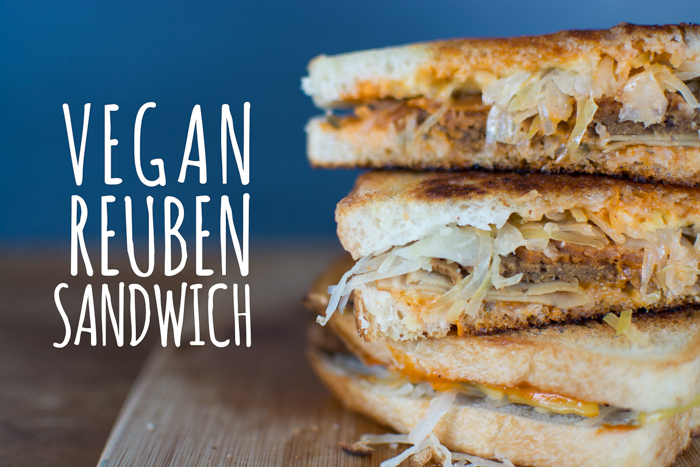 It’s for a delicious vegan reuben sandwich. 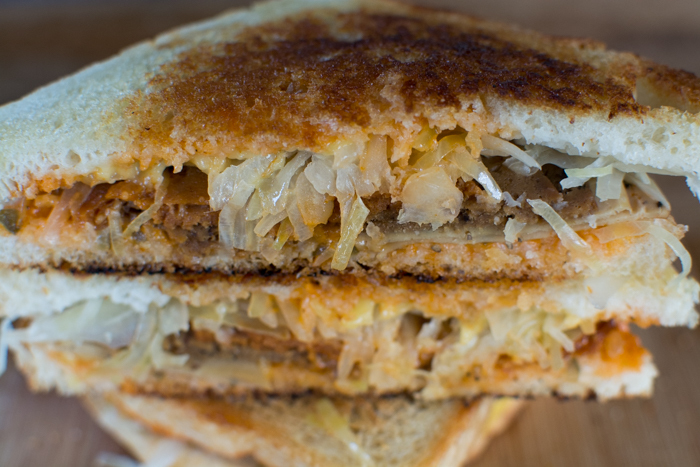 It uses 3 different vegan deli slices to mimic the rich spices that usually accompany corned beef. 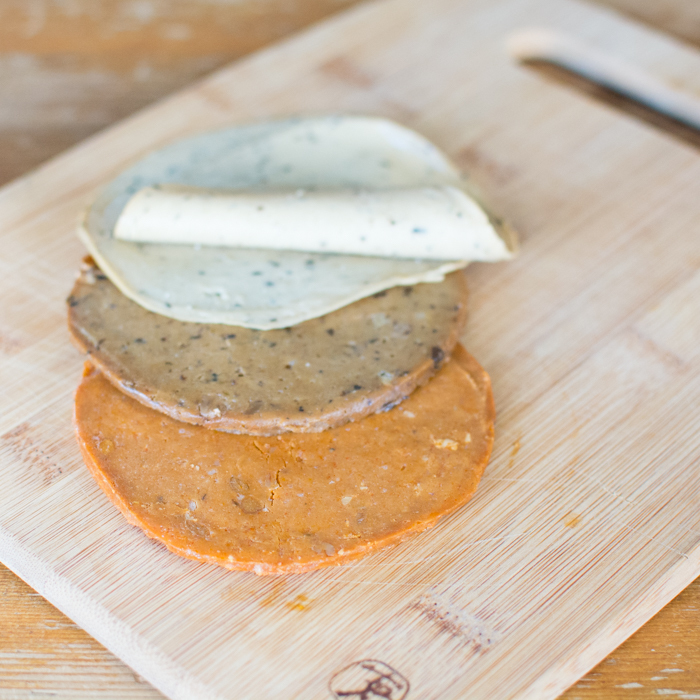 It calls on the best vegan cheese around. Chao from Field Roast. 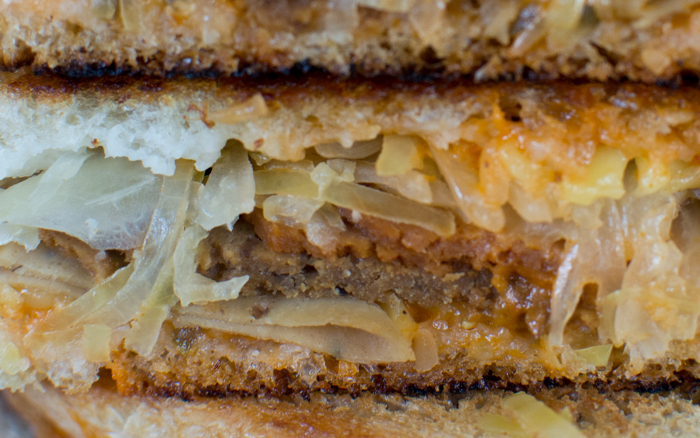 Also on the list of VII—very important ingredients—is sauerkraut. You know that’s a household favorite around here. If the photos don’t speak to you let me explain what the experience is like. 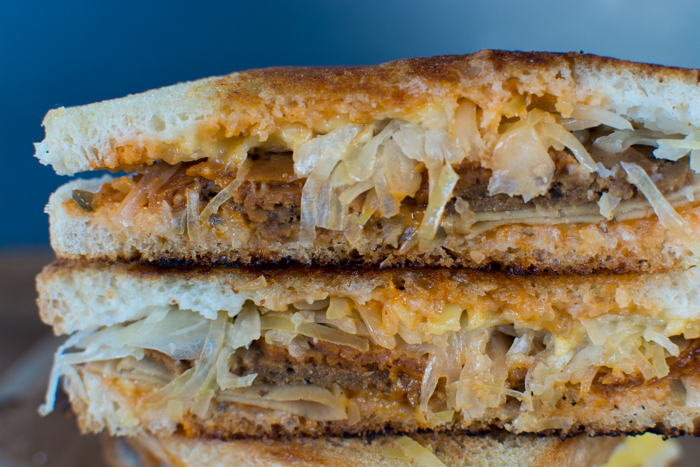 The edges of the bread are crispy as any grilled cheese, but right underneath is a tangy surprise of Thousand Island dressing followed by a creamy havarti/muenster-like cheese that’s interrupted by the tangy salty calling of fresh fermented sauerkraut nestled on top of well spiced vegan deli slices. 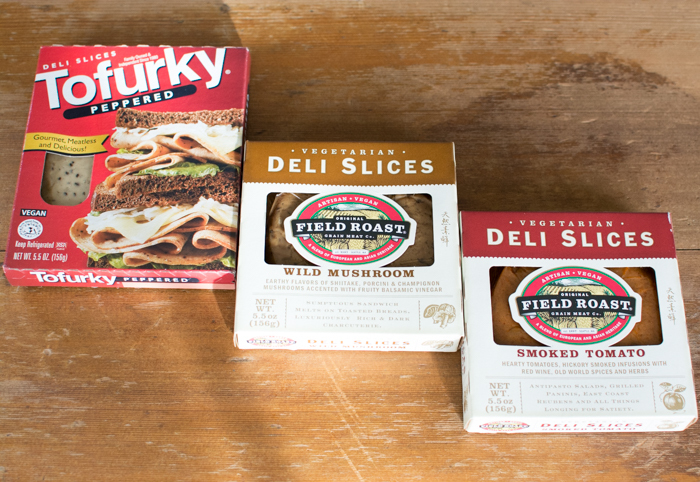 For the deli slices I used Peppered Tofurky, Wild Mushroom and Smoked Tomato from Field Roast. Local peeps can find these deli slices and cheese at Safeway or The Moscow Food Co-op. For sauerkraut I used Bubbies as we are currently out of ‘regular’ sauerkraut flavors. Bubbies is available at Moscow Food Co-op. 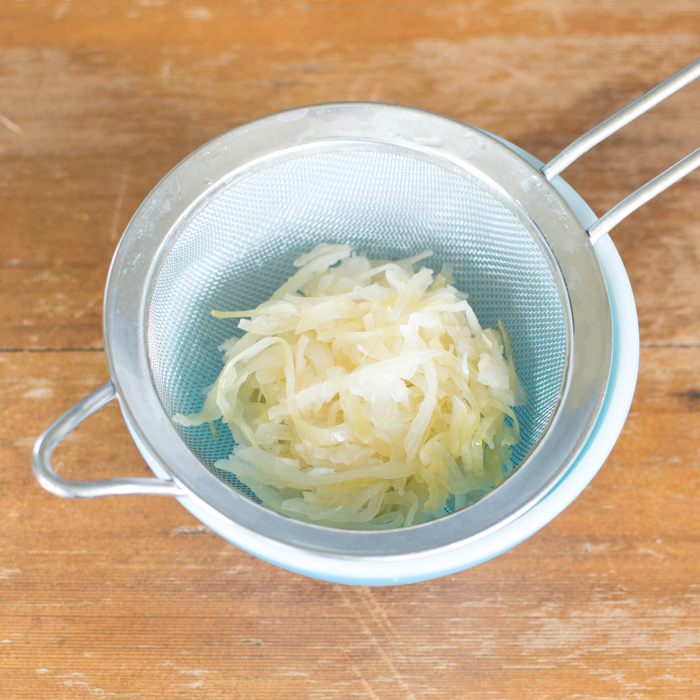 It’s a delicious traditional sauerkraut. I drained it in a sieve before placing it on the sandwich. It helps eliminate any soggy bottom nonsense. Start with a little vegan margarine on each slice of bread, on the alternate side spread some of the Thousand Island Dressing followed by half a slice of Chao cheese (use creamy original or their tomato cayenne), folded slices of vegan deli meat, some sauerkraut, the remaining cheese slice, and the other slice of bread. 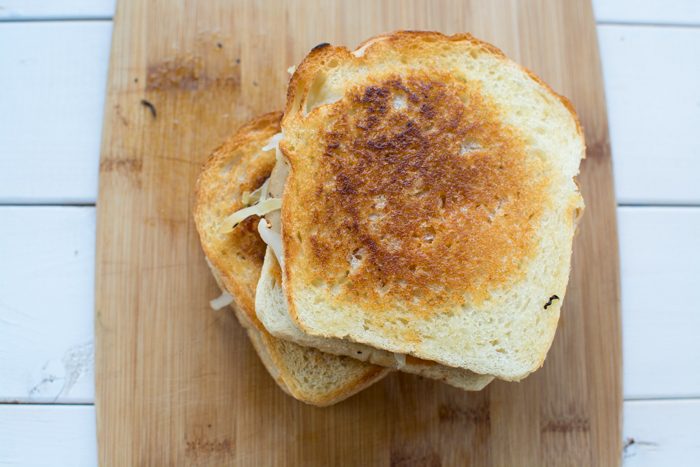 Grill on medium heat with the lid on until one side is crispy and then flip to finish of the other side of sandwich perfection. Spread a teaspoon of Earth Balance on one side of each slice of bread. Spread evenly so it reaches the edges. Place two slices of bread margarine side down in a large non-stick pan. Next split the salad dressing over each slice of bread, then top each piece of bread with a half slice of cheese, followed by 1 slice each of vegan deli meats-fold them in half for nice presentation. 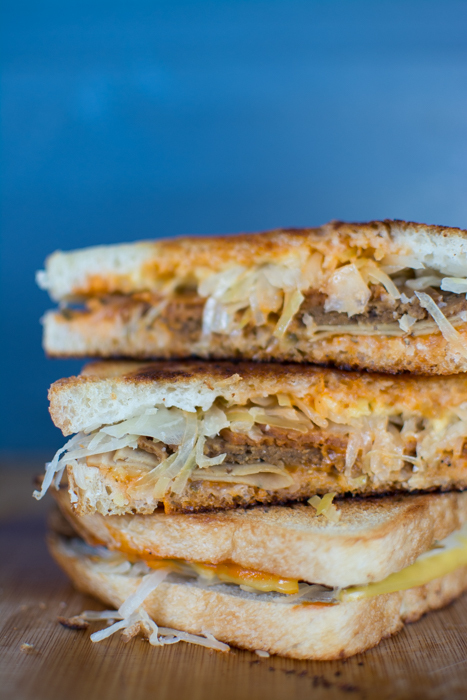 Top each sandwich with 1/4 cup of drained sauerkraut, the remaining halves of cheese, and close the sandwich off with the last slice of bread-margarine side out. Cook on medium heat for 3-4 minutes with the lid on, until the pan side of the sandwich is brown and crispy. When crispy, flip and cook the remaining side an additional 3-4 minutes. Remove from heat and let cool for a few minutes before slice in half. I’ve made this on both salted French bread and traditional rye. It will be great using any hearty rustic bread. Sourdough would be amazing.